Here’s a summary of the latest digital lifestyle coverage on last100. Note that you can subscribe to the weekly wrapups, either via the special weekly wrapup RSS feed or by email. The weekend before last I fired off an email to Apple CEO Steve Jobs, and to my surprise, I actually got a reply (OK, I wasn’t that surprised as Steve has been replying to a lot of emails lately). As regular readers will know, I’m a big admirer of Palm’s webOS (see Palm Pre review) and a fan of the BlackBerry-esque portrait QWERTY form-factor as found on Nokia’s E72 – my current primary smartphone. It’s therefore not a stretch to presume that Palm’s second device running webOS, the Palm Pixi (or to be precise, the Palm Pixi Plus, the GSM variant that adds WiFi), would be right up my street with its portrait physical QWERTY keyboard and multi-touch screen. And for the most part it is, with the exception of an underpowered processor and eye-squinting web browser. Read on for my hands-on review. 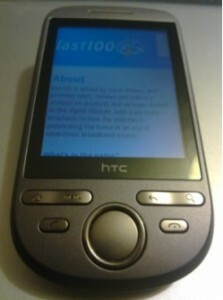 It seems that 2009 is the year of the comeback handset. Palm saw its Second Coming with the Palm Pre (review). Sony Ericsson relaunched with the Symbian-powered Satio (for what good that did them) and a new slogan. And Motorola, after years in hibernation and having completely missed the smartphone boat, unveiled its first Android-powered device, the Motorola DEXT as it’s known in Europe or CLIQ in the states. The DEXT isn’t just any old Android handset, either. Here’s a summary of the last two few weeks’ digital lifestyle action on last100. Note that you can subscribe to the weekly wrapups, either via the special weekly wrapup RSS feed or by email. First up, an apology for not posting as regular as usual on last100. As some readers may already know, I’ve recently been appointed as Contributing Editor at TechCrunch Europe where I’m helping to cover the European technology start-up scene. I’m also doing quite a bit of consultancy work at the moment for Curverider, the company behind the open source social application engine, Elgg. That said, I’m hoping to juggle my time a little better now that I’ve settled in at TechCrunch and to post more regularly again on last100. Although if anybody is interested in helping out from time to time or doing the odd guest post then please get in touch. I don’t really have any budget (for the right person, I’ll try and find some) but it could be good exposure for someone starting out in the world of tech and gadget blogging and wanting to get ‘out there’. The remit as usual is primarily news and analysis of the Mobile, Internet TV and Digital Music space. We love hardware and app reviews too. I’ve written up my Day One impressions of the UK version of the Palm Pre, along with a tongue-in-cheek description of the PR back-story, in my debut column — working title: Gadgets and canapés — for Ewan MacLeod’s Mobile Industry Review (MIR). Late last night I looked down at my unibody Macbook’s keyboard and, shock-horror, the zero key had melted! Here’s a summary of the last weeks’ digital lifestyle action on last100. Note that you can subscribe to the weekly wrapups, either via the special weekly wrapup RSS feed or by email. last100 is proud to be a media sponsor of this year’s NewTeeVee Live conference. Better still, readers qualify for a 10% discount on tickets to the event. Having lived with the Vodafone HTC Magic for a few months now, there are a few things that really bug me about the standard version of Android. Yes, this is going to be a bit of rant. Opera, the Norwegian company behind the desktop and mobile web browser of the same name, wants to be a major player in the nascent Internet-connected TV space. Here’s a summary of the last few weeks’ digital lifestyle action on last100. Note that you can subscribe to the weekly wrapups, either via the special weekly wrapup RSS feed or by email. Forget Chrome OS versus Windows (for now), there’s another Google / Microsoft battle taking place right in front of our eyes and Google’s winning. No, I’m not talking search. That war is over and Google was victorious a long time ago. I’m talking mobile. Android versus Windows Mobile to be precise, where Redmond is looking a little vulnerable to say the least. I’ve only owned an Android OS-based phone for a few weeks – the HTC Magic (see my review) – but even in this relatively short amount of time I’ve been hitting Google’s mobile app store, the Android Market, pretty hard in search for the best and most useful third party apps the platform has to offer. You are currently browsing the archives for the last100 weekly wrapup category.